Abstract: We expect the Albatron PX865PE Pro II will have a lot of "goodies" as well, and hopefully offer a little more in terms of overclocking. With the release of mainstream i865 chipsets today there will be soon an influx of new Pentium 4 motherboards on the market from which to choose. Albatron have never been one to sit ideally by and pass on a technology advancement; so grab a coffee and get ready to follow long as we test drive the all new Albatron PX865PE Pro II motherboard. The PX865PE Pro II is of course based on Intel's freshly launched i865PE Springdale chipset, which coincidentally enough, actually launched in spring. Boasting support for 400MHz, 533MHz and 800MHz FSB based Pentium 4's (Northwood or Prescott core) processors, the Springdale chipset forms the basis of Intel's 'mainstream' dual channel DDR chipset strategy. The only downside to Springdale is that the i865 no longer carries on support for older 'Williamette' based Pentium 4 processors, or even socket 478 Celeron CPUs for that matter. After testing the AOpen i865 AX4SPE MAX motherboard we were generally impressed with what it brought to the table. Stock performance was good, and the board was loaded to the gills with features. We expect the Albatron PX865PE Pro II will have a lot of "goodies" as well, and hopefully offer a little more in terms of overclocking. In terms of the extra's, Albatron pack in Serial ATA/Serial ATA RAID (ICH5R, RAID-0 only) and an additional Ultra/133 Promise IDE RAID controller (PDC20276), an Intel 547EI CSA Gigabit NIC, two IEEE 1394 ports, dual BIOS's and even a 7.1 audio soundcard (software codec)! It's basic marketing 101 that adding flash to a product will attract potential customers, and to that effect the PX865PE Pro II does this in couple ways. The most visible aspect is the copper northbridge heatsink which cools the i865 chip. Behind the translucent spinning fan are a set of colourful blinking LEDs that turn on and off in a pattern and should look pretty cool behind a clear case panel. The layout of the PX865PE Pro II motherboard is nice; the main 20-pin ATX power and IDE channels are at the best possible location to the right of the DIMM slots where there is little chance of them getting in the way. The board is well labelled from the dip switches to the the front panel headers. I wish more manufacturers would include a DIY installation guide that's as thorough as the one that comes with the PX865PE Pro II. It makes the motherboard installation very simple and it's certainly much easier to work with when bent over an open case than a manual. For the newbie overclockers out there, Albatron include a small section explaining overclocking that's quite detailed, yet easy enough for even a novice users to understand. 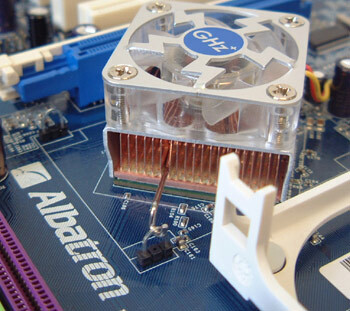 Because Pentium 4 processors rely on the 12V line for their power, Albatron places the ATX12V line near the MOSFETs so the processor can get the cleanest signal. The new 196 PBGA Intel 82547EI 10/100/1000 Base-T Gigabit LAN chip is one of the first CSA based Ethernet adapters on the market. The small BGA chipset does not require any form of cooling as it works fine with zero airflow. The 82547EI has a direct 16 bit DDR bus that runs at 133 MHz and has a maximum bandwidth of 266MB/s, just enough to keep a fully moving Gigabit NIC happy (Maximum bandwidth for a Gigabit NIC running full duplex is 2Gb/s or 250 MB/s). This also free's up the PCI bus for the other system devices. This system potentially allows for better system performance when all the devices in the system-bus are under load. More on CSA in a moment. Next let's have a look at the new ICH5R southbridge.